As many of you will now know, Intel introduced the 8th Gen Core processors and accompanying Z370 chipset last week. Now offering more cores and threads for your buck, the headline Core i7-8700K overclocks nicely while the six-core, six-thread Core i5-8400 is our pick of the new bunch. If you have settled on your next upgrade being to this platform, which motherboard do you go for? 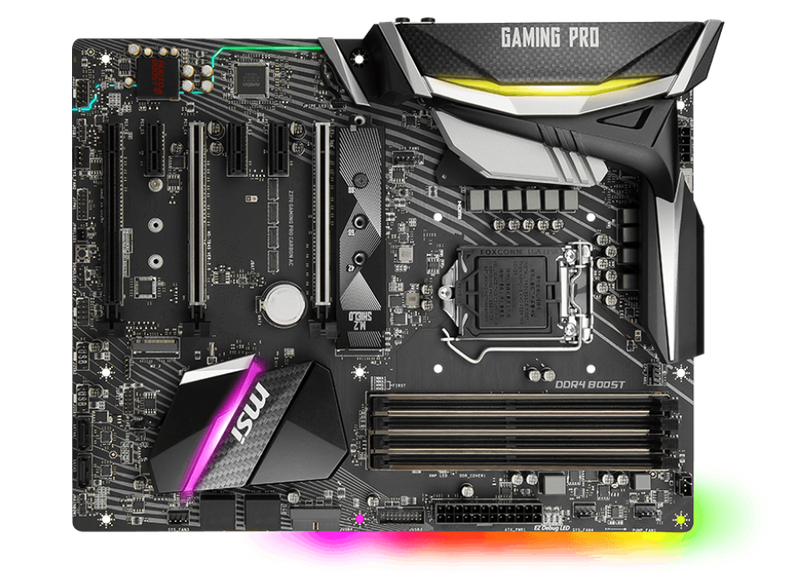 Interesting question and one that we have attempted to answer with a look at boards from Asus and Aorus. We now turn our attention to the final name on the 'big three' list - MSI. As expected, it has a number of Z370 boards that span the pricing spectrum for the new chipset. The one that has most caught our eye is the Z370 Carbon Gaming Pro AC, priced at around £190. It is instructive to take a look at the previous version, Z270 Pro Carbon, and see what has changed. MSI uses the same power regulation on both boards, so a total of 10 all-digital phases to the CPU, but surrounding them is a revised heatsink design that has carbon fibre-like strips that lend the board its name. Tucked away in one corner is the obligatory 8-pin CPU power connector, but it feels harder to get to than the previous model. While competitors line the CPU socket with as many fan headers that they can get away with, MSI is rather miserly on this front, with a single 4-pin in close attendance. A pump header and system fan header are close by, but we'd ideally want more, closer. In total, there are four 4-pin system fan headers, the CPU fan header and a 4-pin watercooling header. 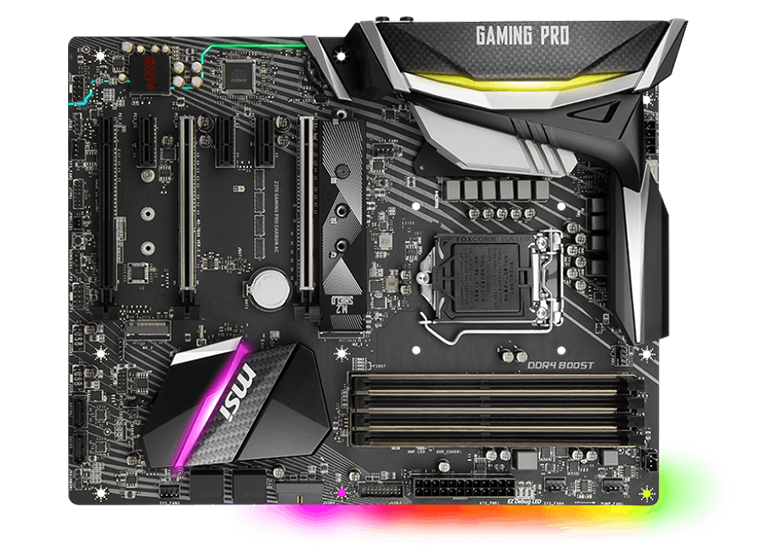 Adding headers for RGB lighting - on top of what the board has in various sections - has become a bigger deal on this iteration of boards. Fulfilling that need, MSI has two 5050 RGB LED (Rainbow) strip connectors working off 12V, a single WS2812B header that can address each RGB on a strip individually, and as a nod to the growing partnership between MSI and Corsair, a specific header for the latter company's products. A couple of internal USB 3.0 connectors (one rotated) serve up front-panel support, yet as we have mentioned before, it's a shame that sub-£200 boards aren't recipients of USB 3.1 Gen 2 Type-C headers. The more motherboard guys put these on, the more opportunity there will be for chassis manufacturers to start doing the same. MSI splits the SATA connectors to enable better case cabling. A group of four, split into two pairs, are resident by the southbridge whilst a couple of rotated ports line the left-hand edge of the board. Most folks will only use a couple, so at least there is some flexibility in what you use and where. Be mindful of just what storage you attach where, because the Z370 chipset, through no fault of any motherboard manufacturer, is a case of compromise should you want to populate most ports. The matrix of how MSI juggles PCIe (or SATA) M.2 and Sata is worth understanding, but pertinently, having a single M.2 PCIe drive means you can use all SATA ports concurrently. Using both M.2 slots in the preferred PCIe mode disables SATA ports 5 and 6. The compromise is standard fare for Z370. MSI strengthens the two PCIe x16 slots interfacing with the CPU and leaves good space between them. The rotated nature of the SATA ports means that full-length cards don't get in the way of associated cables. Three PCIe x1 offer expansion opportunities; MSI gladly takes one with its 802.11ac WiFi implementation, which is an add-in card instead of a board-mounted Asic - we'd prefer the latter. The supplied combination WiFi/Bluetooth card (Intel AC8265) needs to be connected to a USB 2.0 header,	too. A non-AC version of this board also exists, cheaper by around £10, hence why MSI went down the add-in board route for this model - it can have two boards coexist without needing different PCBs. You do miss some enthusiast-orientated niceties when dropping below the £200 mark on Z370. There's no debug LCD, for instance, no power or reset button, and no clear-CMOS button on the PCB or I/O section. Of course, pay more for a model higher up the range and the luxury spec beings to appear. MSI keeps the rear simple and straightforward. USB 3.1 Gen 2 is provided by the ubiquitous ASMedia 3412 controller that offers both Type-A and Type-C support, albeit no Thunderbolt-carrying capability. Intel is once again the provider for Gigabit Ethernet, though there is no means by which to team the WiFi and wired LAN for additional performance. DisplayPort and HDMI remain sensible output options for the 8th Gen CPUs' graphics. The firmware is largely the same as the Click BIOS 5 that came before it. This time around, MSI has listened to our previous criticisms and included an easy way of upgrading the BIOS without having to navigate multiple screens. Simply press Ctrl+F5 to go to the BIOS-upgrade screen. Auto-overclocking is also taken care of on Z370 through Game Boost. MSI has profiles for various chips, rather optimistically in our opinion, with Core i7s able to hit 5.4GHz and unlocked Core i3s to 4.7GHz. Good luck with 5.4GHz though!